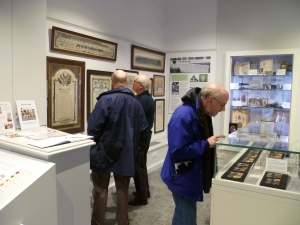 On Friday 13th April 2018 a group of people from the project visited the Bankfield Museum, Halifax, the home of the Duke of Wellington’s Regimental Museum. 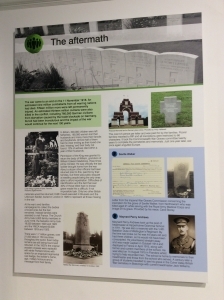 Many of the Farnhill WW1 Volunteers served in the Duke of Wellington’s (West Riding) Regiment and we spent about two hours looking at the displays dedicated to the regiment’s history and a special exhibition entitled “For King and Country”, about the First World War, which runs until 22 December 2018. 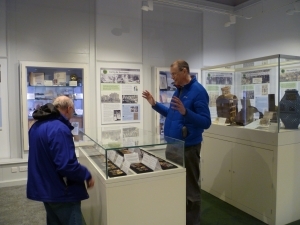 We were shown round by John Spencer, Curator of Military History, who was kind enough to spend all morning with us. 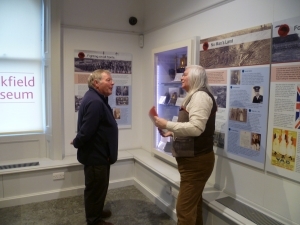 There was also time afterwards to see other parts of the museum including textile displays and the library, and to take in the historic surroundings of the former Victorian mansion in which it is housed. A visit, not just for the regimental display but to see the museum as a whole, is highly recommended. Going by the feedback received afterwards it was a very enjoyable and informative experience. The WW1 exhibition, “For King and Country”, runs until 22 December 2018.